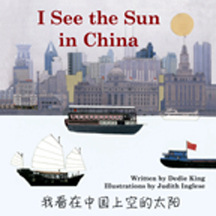 Author Dedie King and illustrator Judith Inglese successfully open readers' eyes to the daily life of children living in foreign lands through their children's book series, "I See the Sun in... "
If you have grandchildren, these books are a wonderful way to share more of the world with them. In the first book, "I See the Sun in China," chidren will learn about the daily activities of a young Chinese girl as she gets up and ready for the day in her small village and then travels to visit her aunt in Shanghai. Along the way she meets her aunt's friends and the people she works with, and she falls asleep thinking about all she has experienced that day. This book has won several awards. In the second book, "I See the Sun in Nepal," the author again writes in simple prose about another young girl and what her daily life is like, accompanied by beautiful collage illustrations, as are all of the books in the series. Other books planned for the series include ones set in Afghanistan, Russia and India. What a wonderful way to introduce young chidlren to others who live in different cultures; to learn how their lives are different and how they are the same. To learn more about the books, visit here. As you probably have heard by now, the Pittsburgh Steelers lost in the Super Bowl last night to the Green Bay Packers.The team didn't play well (giving up three turnovers which resulted in 21 points for the Pack). It's hard to overcome that, no matter what storied history of big comebacks a team might have. The fans here are completely committed to the Steelers and won't let this small bump in the road stop them from rooting for the team. The Terrible Towels will live to wave anotther day. I wore my Steeler sweatshirt today as one last hurrah before we put them away till next season. There won't be a parade to attend in town this year, unfortunately, and we can no longer ignore February in Western PA. with all of its drabness. Sigh. But the Pitt Panthers are still riding high and the Penguins are always fun to watch, and a new season of Glee has started. . . Spring can't be too far behind.